First of all, we’re going to ice the cake board. For this cake, we’re going to make the board look like a piece of slate. Follow Shawna as she teaches you the methods to create a very realistic looking slate effect. Shawna uses an Agbay Cake Leveller to level the cakes, don’t worry if you don’t have one of these as you can use a knife. The cakes are then piled high using ganache between each layer and Shawna shows us how to carve the pot shape in simple, easy-to-follow steps. Once you’ve carved the cake to the tapered pot shape, it’s time to ganache the cake. In this lesson, Shawna also shares her useful techniques to get the cake perfectly level. Once a good amount of ganache is added to the cake, you can scrape the ganache to produce a smooth finish. You can use the top board as a rough guide for your scraper as Shawna explains. The finished result looks great and after some refrigeration, the cake is ready for icing! 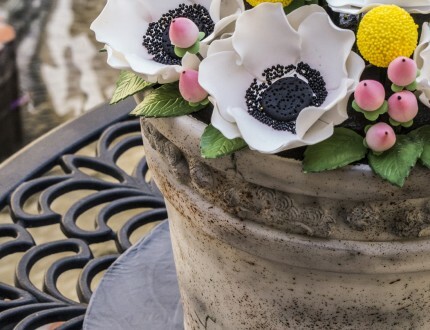 This antique flower pot needs flowers! 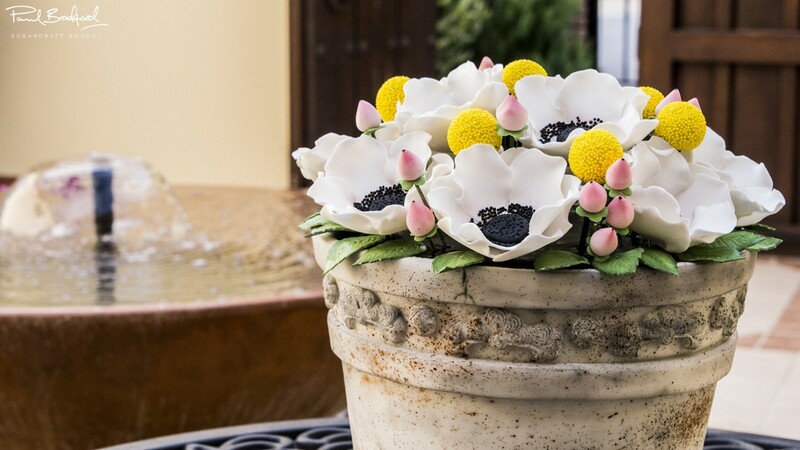 In this lesson Shawna teaches you how to make a beautiful Anemone. 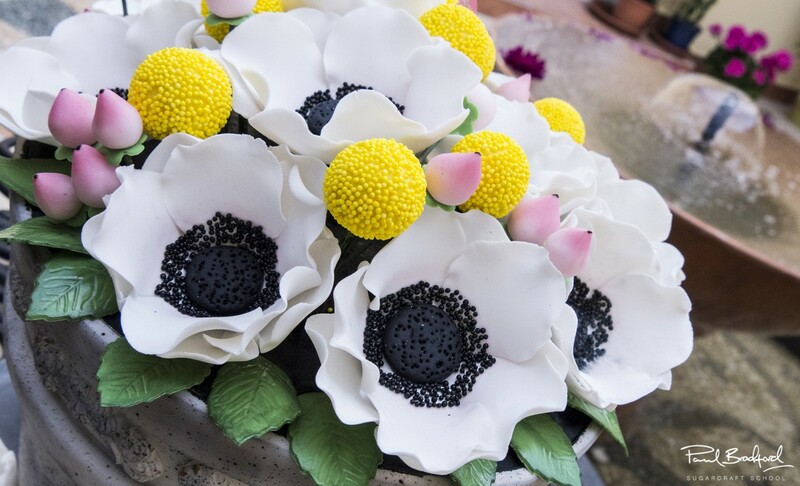 TIP: It’s a good idea to make these flowers two to three days in advance of the cake where possible. Shawna continues to make the flowers and uses petal dust to shade the flower. As mentioned, it’s a good idea to try and make the flower two to three days in advance if time allows. 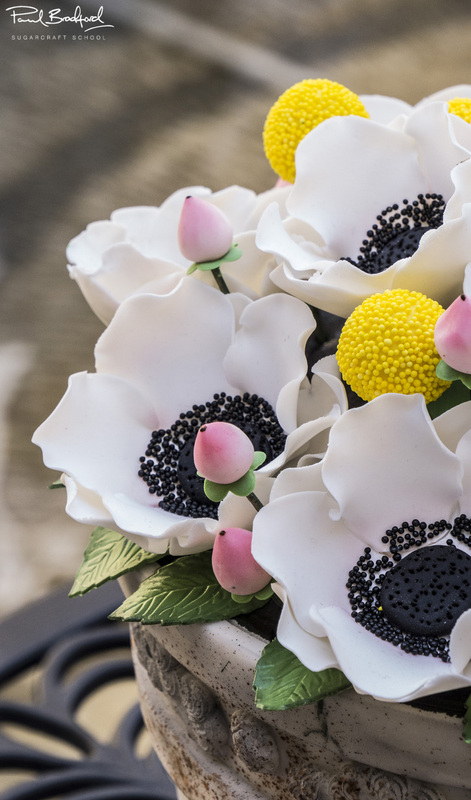 Continuing with the creation of flowers, Shawna teaches us how to make Billy Balls flowers, also known as Craspedia. 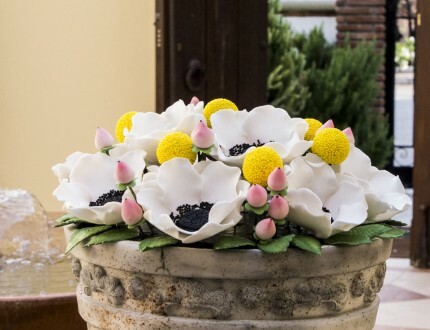 The second part of the Billy Balls flower creation covers the addition of the ball of the flower and attaching the edible beads. Next with the floral lessons are the little pink berries, starting with a spaghetti stick and some edible paint to make the steam. Once we’ve coloured our stems, we’re ready to make the pink berry itself (you can always change the colour if you’d prefer something different) starting with a tiny piece of sugarpaste to create the berry. Then more details are added to the berry to add realism. This lesson covers the creation of the leaves and Shawna shares her quick and easy method to get the leaves created for this cake. The cake should now be nice and solid after some time in the fridge, so it’s time to ice this relatively tricky looking shape. Follow Shawna’s advice and you’ll be iced and ready to decorate in no time! Shawna adds the trim to the bottom (which will become the top!) of the pot. 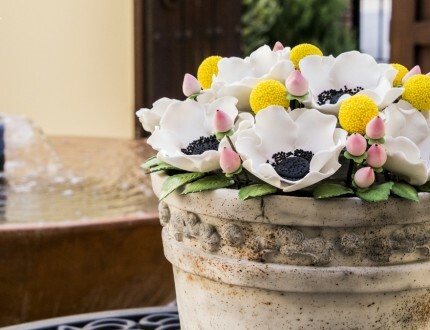 Decorative scrolls are also created and added to really create an antique-style flower pot. A ribbon cutter is used to mark a guide line on the cake and this allows the final trim detail to be applied nice and level to the pot. The antique pot should be looking great now with all the trim detail, but not quite antique looking yet! Shawna shows us how to colour the pot using petal dust shading techniques that really highlight the details. When you’re happy with the petal dust application, it’s time for the fun part! 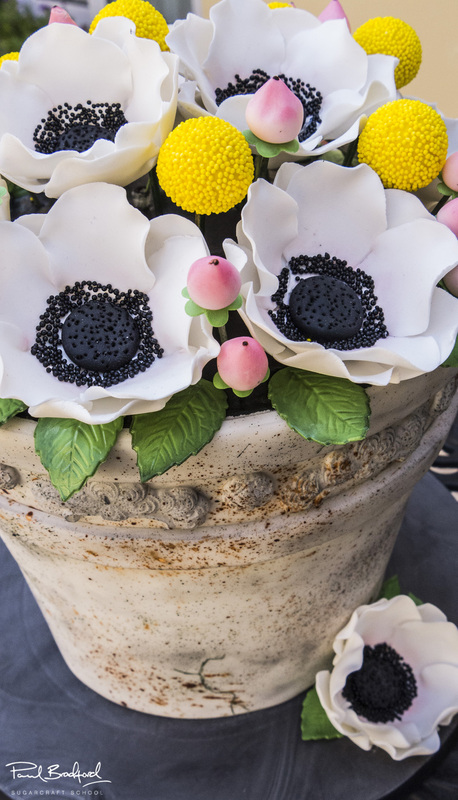 Splattering the paint onto the cake flower pot gives a fantastic result…make sure to use a brand new toothbrush! Shawna starts this lesson by transferring the cake to the slate styled cake board. Next, it’s time to place the flowers onto the design and now things are really starting to come together. 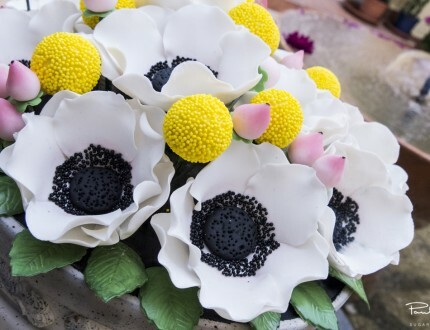 With the Anemone’s placed on the cake, you can then place the Billy Balls too. Simply fill in the gaps up with these and you should end up with a great, well-balanced arrangement! Shawna adds some finishing touches to the cake by adding some leaves to fill the gaps and then everything’s complete…now breathe a sigh of relief! Well done! 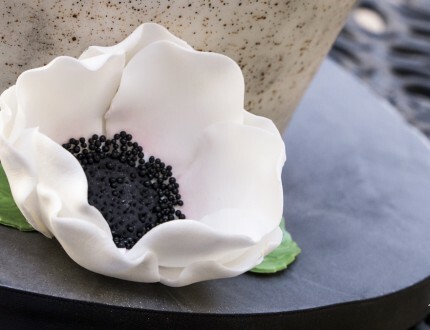 In this lesson, Shawna shares some ideas that you can implement when making this cake to make it unique to you. 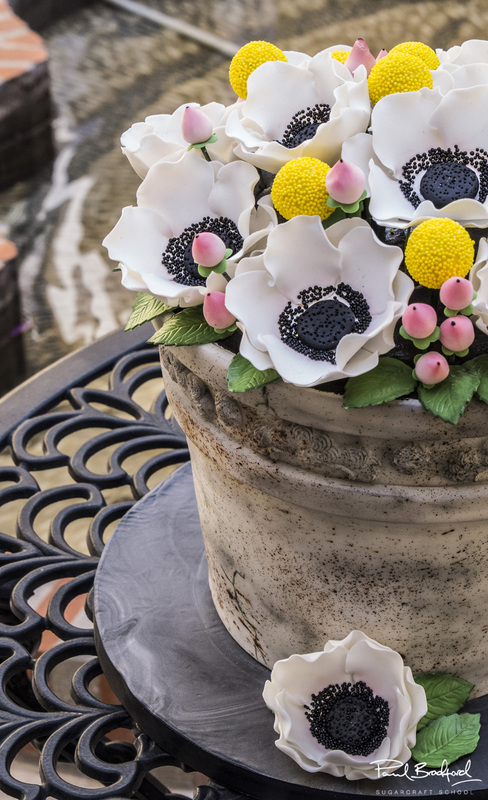 We would love to see your version of the Antique Flower Pot Cake, so please share your pictures with us on our Facebook Page! 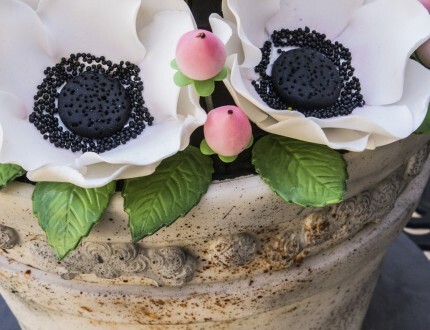 We welcome the wonderful and talented Shawna McGreevy into the studio to teach her Antique Flower Pot Cake tutorial. 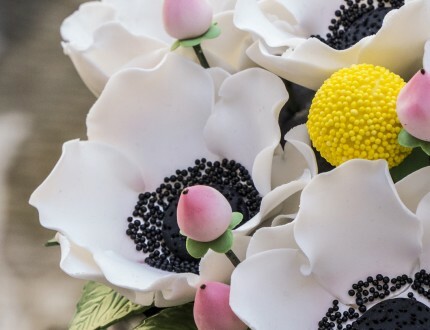 This course will go through everything you need to know, from start to finish, including carving the pot, creating and positioning sugar flowers, and the all important texturing and finishing touches which lend the pot and flowers their very realistic look. 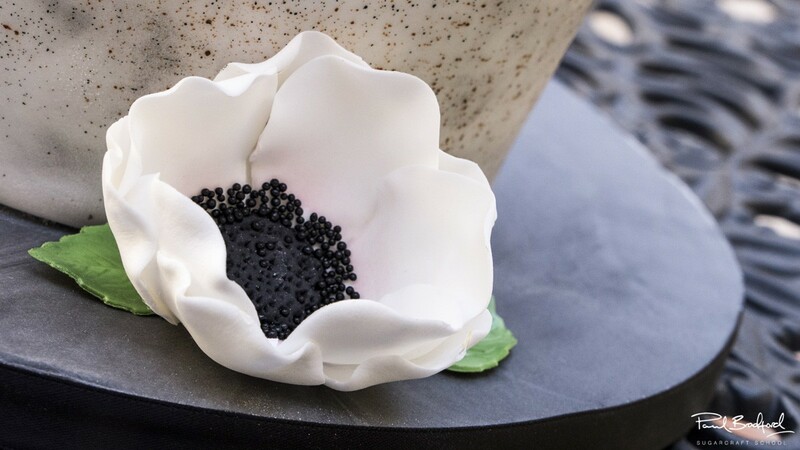 Shawna will cover lots of useful tips and techniques to help you recreate this cake, or your own unique variation! Aimed at intermediate level cake decorators, this cake will take a two days to create, allowing for drying time. 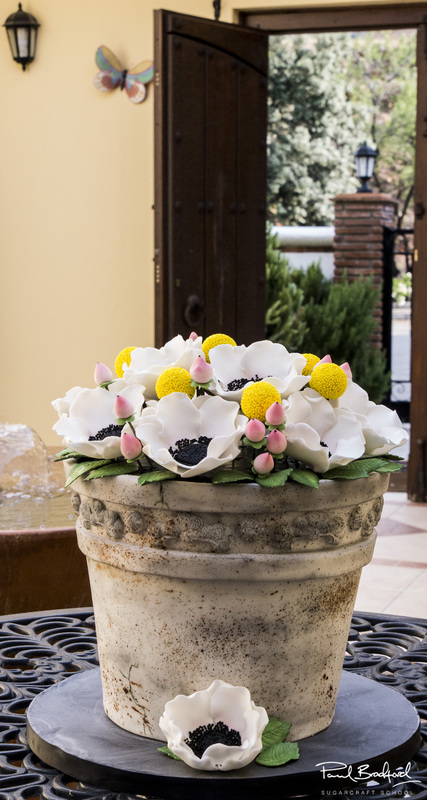 We would love to see your take on the Antique Flower Pot Cake – please share your photos with us on our Facebook Page! Shawna loved trying out new ideas and techniques that she had researched, and baking up new and delicious recipes. She was continuously making cakes and cupcakes for family, friends, and acquaintances. 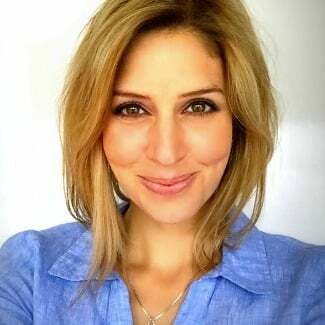 And, not long after, she decided to take a leap of faith and launch a little cake company called McGreevy Cakes Specializing in the art of cake. (With a li'l tomfoolery thrown in. ;) You can view my work on my website www.mcgreevycakes.com and see more detailed pictures on my McGreevy Cakes Facebook page.